Product prices and availability are accurate as of 2019-04-13 04:55:29 EDT and are subject to change. Any price and availability information displayed on http://www.amazon.com/ at the time of purchase will apply to the purchase of this product. This variety pack contains ten of the most delicious and beautiful heirloom tomato varieties around. 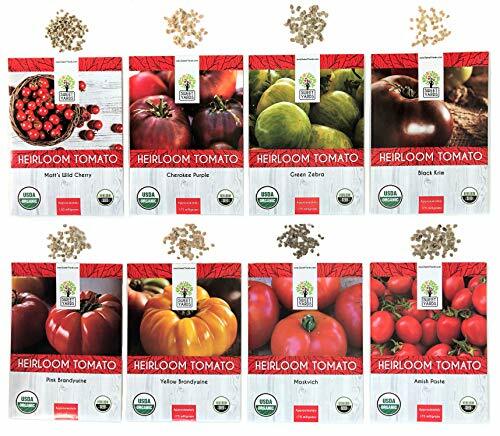 All seeds are Certified Organic and GMO Free. 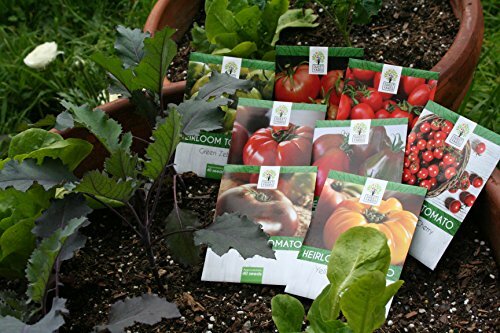 Each comes in its own individual packet containing approximately 30-40 seeds! The freshest and best tasting tomatoes will always come from your own backyard. 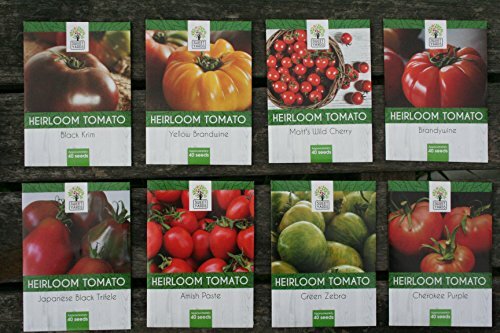 And these ten heirloom varieties will really wow you with their beauty and taste. 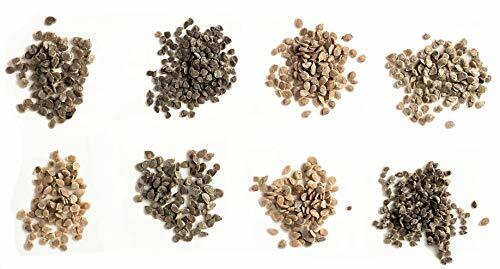 All the seeds are for this growing season and have germination rates of 90% or more. - Black Krim: A medium sized 6-18 oz fruit with dark red color and an amazing deep smokey flavor. - Cherokee Purple: A very old variety with a dusty pink-purple color and a strongly sweet and meaty flavor. - Pink Brandywine: Very large 1 lb fruits with an amazing pink-red color and superbly rich and smooth flavor. - Yellow Brandywine: An orange version of the delicious red Brandywine. A rich flavor and beautifully intense color. - Amish Paste: A very large meaty Roma-style paste tomato that is one of the best for canning, paste or sauces. - Green Zebra: A very beautiful tomato with 3-4 oz. size and tangy flavor. Ripens to a slightly yellow color with dark green stripes. -Matt's Wild Cherry: This small heirloom cherry variety packs a big flavor. Deep red color and a tender, smooth and very sweet taste. - Yellow Pear: Abundant producer of juicy, small pear-shaped yellow tomatoes with a tangy taste. Produces all season long but must be picked as soon as fruit are ripe. - San Marzano: Abundant producer of medium sized paste tomatoes. Packed with dense flavor and high percentage of solids make this a great choice for canning, processing, and cooking into sauces. Tomatillo Grande Rio Verde: Though related to tomatoes, tomatillos are a whole different culinary experience. Fresh, tangy, and citrus flavors make this fruit great for salsas and Mexican dishes raw and cooked. 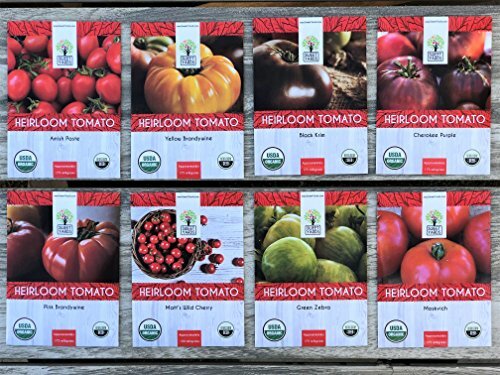 Garaunteed to include the Eight Varieties shown in individual seed packets so you know what you're buying and you know what you're growing. Comes professionally packaged to block out light and moisture and assure these seeds stay viable for years to come. Packaged for 2017 with germination rates of 90% or more so you know nearly every seed will give you a healthy plant full of delicious fruit. Approximately 40 seeds per packet, which gives you to share with you friends and family or store for years to come. 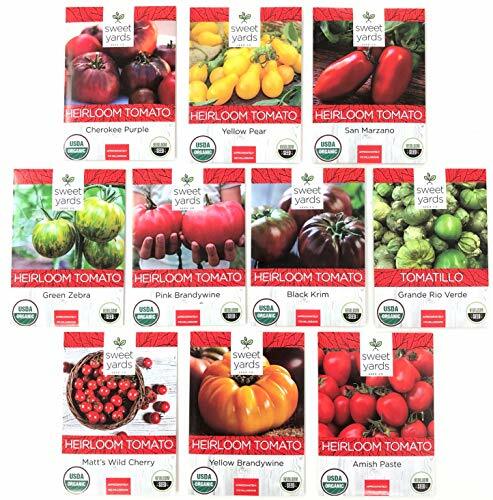 All Heirloom, Certified Organic, and GMO-Free seeds guarantee that your tomato plants start off safe and pesticide free.